It's Day 2 of the 100 Blocks Blog Tour Road Rally! 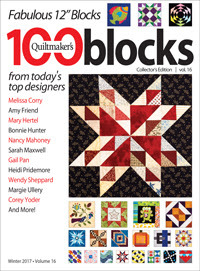 Quiltmaker's 100 Blocks is packed with inspiration--100 blocks worth! If you haven't seen the issue in stores yet, here's what to look for. Before you buy it, scroll to the bottom of this post, because Quiltmaker has given us one issue to giveaway! 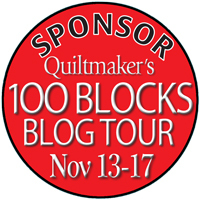 so we're proud to be a sponsor of the Blog Tour. What does this mean? In addition to a chance to win a magazine, keep an eye out for other yummy fabric prizes provided by us throughout the tour! 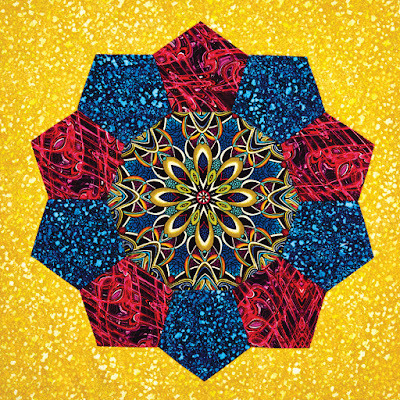 Let's take a look at the blocks in the magazine featuring Benartex fabrics. 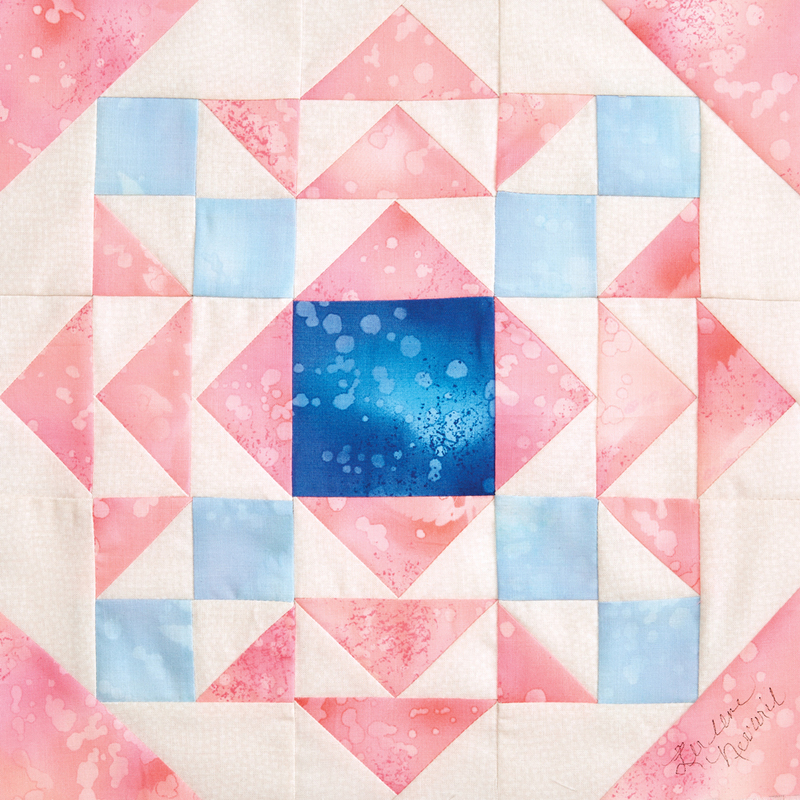 For a chance to win a copy of Quiltmaker's 100 Blocks Volume 16, leave a comment below letting us know which of the three blocks featuring Benartex fabric is your favorite. Giveaway is open through Friday, November 17th at 11:59 pm EST. 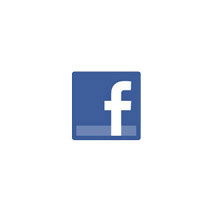 Head over to Quilty Pleasures to find links for additional posts featured today. This was not easy, but I am going with Jagged. It is such a striking block. This was a difficult decision but exploding stars took it by a thread. All of them are wonderful! Tough choice, but I picked exploding stars! I love Debby's block (Pentagon Wreath). It is a very dynamic block with the rich looking colors. well, I'm intrigued by the shapes of Jagged, loving the colors of Pentagon Wreath and Exploding Stars seems possible in my world...so which one....no way I'm choosing. I would have to say the Pentagon Wreath is really fun but I also really like the other two blocks. Thanks for the giveaway. Love the Pentagon Wreath block. It is always so exiting and inspiring when 100 Blocks comes out. never miss one. I love the Jagged block, #1514. I get so excited when I see new blocks and would love to make them. They are all great blocks, but Jagged is my favorite. It is very eye catching. Block 1538, Pentagon Wreath, only because I've become enchanted with paper piecing and hand applique. I would love to make this block. 1514 gets my motor running. And it is getting hard to start! Love Jagged - it is really edgy and modern! my favorite block is Exploding Stars. I love the colors used. #1538 I love Paula's fabrics! Love pentagon wreath. It could be used for many focus fabrics, but the Paula fabric used is stunning! My favorite is Block #1538. The Paula fabric makes it pop. I like the more traditional Exploding Stars. All are interesting and great designs. My pick is Block #1538, Pentagon Wreath. The Pentagon Wreath is my favorite. Block #1514 is my favorite. I like the colors and the clean lines. I really like Jagged #1514 using Improv. Pentagon Wreath #1538 is my choice - I love the fabric combination! Fossil Fern because I could use color in a lot of different ways. My favorite is: 1538, Pentagon Wreath, designed by Debby Kratovil using Kismet and Fabricadabra by Paula Nadelstern . I like the fabric and the simple design. Block #1514, Jagged is my favorite. Pentagon Wreath is my favorite. 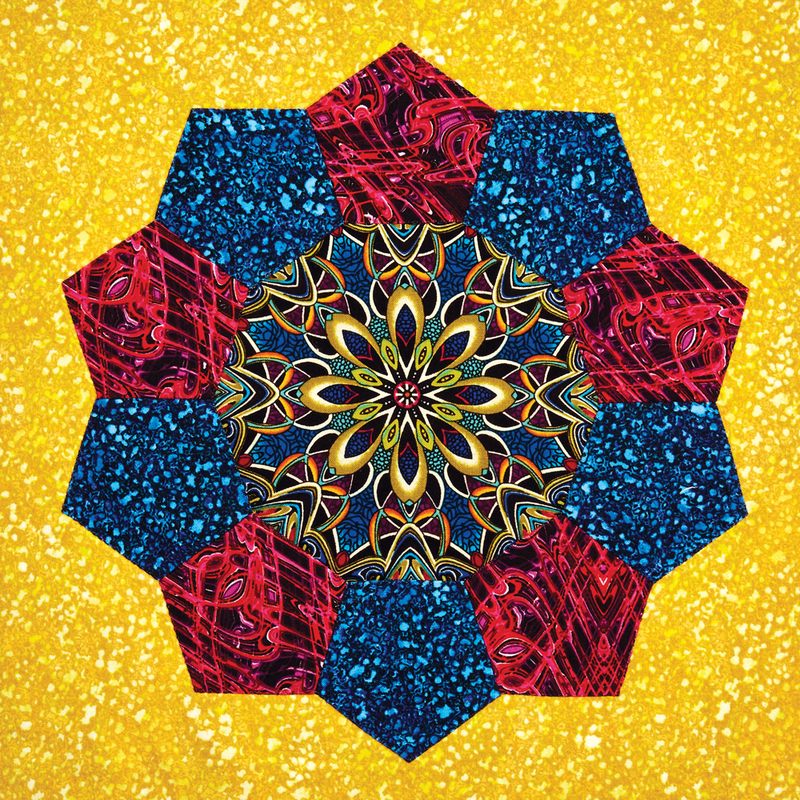 My favorite block is #1538 Pentagon Wreath by Debby Kratovil. She chose a simpler design but with using the magnificent fabrics that she did; the block just becomes Magnificent! Plus, the block and her choice of fabrics also wants me to "play" with the fabrics and try them in so many layout possibilities! Thank you for sharing these wonderful blocks and fabrics, plus the opportunity to win an issue of this magazine and supplying so many great prizes throughout the Blog Hop!! Exploding Stars is my favorite. Pentagon wreath hands down. Love Paula's fabrics. Amy Friend's block is my favorite. Anything paper pieced always gets my attention. Plus her fabric line is just wonderful. I like the Pentagon Wreath. So many ways to do that center! I have to go with pentagon wreath. They are all great, but I like Block #1538, Pentagon Wreath, because of the rich colors. 1538 is my best favourite.All are fantastic!! Exploding Stars gets my vote. Different color variations would make for lots of choices. My favorite of the three is 1580 - Exploding Stars. Exploding Stars is just stunning! If I have to pick just one it would be Exploding Stars. Stunning! I love both Pentagon Wreath and Exploding Star, but I would give Pentagon Wreath the edge. Love all. Exploding Star would be my choice! Block #1538 Pentagon Wreath ~ only because it will work with the EPP I'm planning at this moment, and I hadn't seen this previuosly ~ so, of course, must get it. Thanks! Block #1580, Exploding Stars, is my favorite. I like block 1580 using fossil fern fabric. I love exploding stars...maybe it is the color of the fabrics used. But all three are wonderful. Exploding Stars is my favorite!! All are great blocks but Bagged is my favorite. Thanks for the opportunity to win. 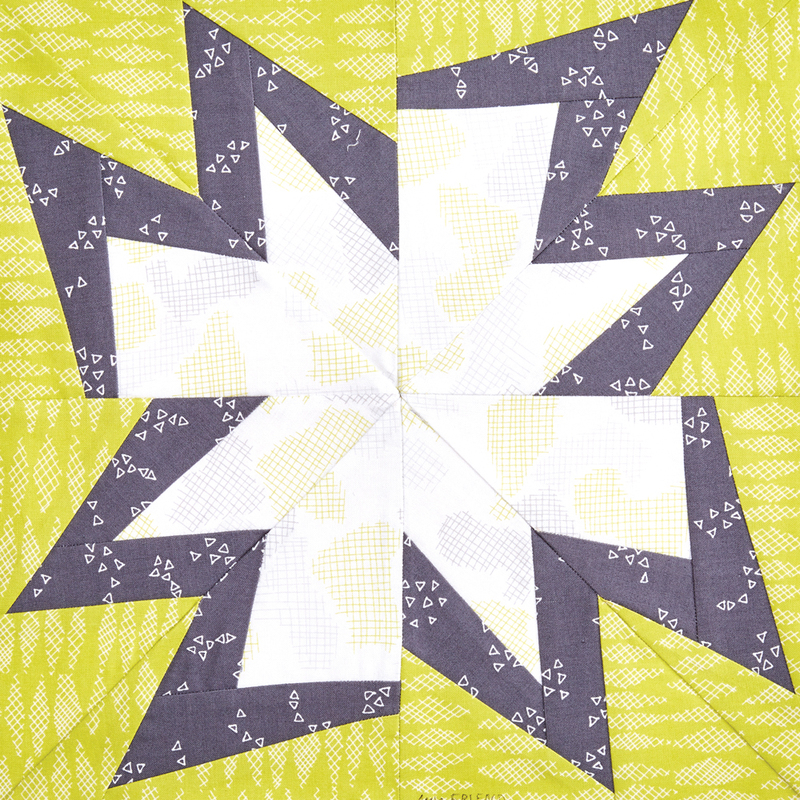 i like the fabrics in the Pentagon Wreath and the block pattern in the Jagged block. The fossil fern block 3 catches my eye the most. Love pink, like the softness appeal, traditional block but the fabric gives it a modern lift. xploding Stars, designed by Lerlene Nevaril - LOVE Fossil Fern. I like Pentagon Wreath best--Debby's block using Paula's fabric! Debby Kratovil's block is stunning and really is a showcase for the fabric. I would have to say that it's my favorite of the three. I like "Jagged" - very cool! I love #1580, Exploding Stars, the color combination with the stars is soothing to me.